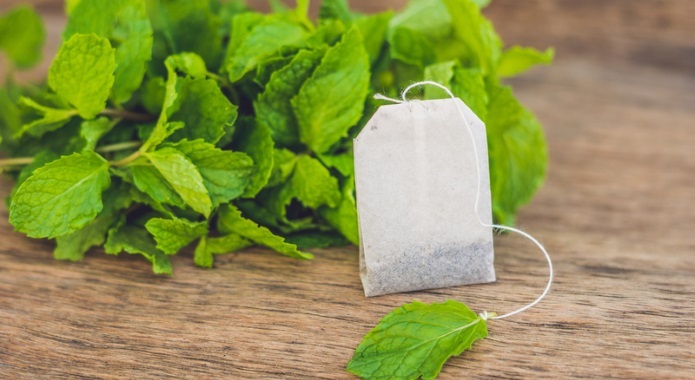 I bet you have already heard of many health benefits of peppermint tea and now you want to learn which brands of mint tea are the best. I have looked all over the internet and e-shops to discover the best of the best. Below is a list of top 10 brands that are according to my personal opinion truly excellent. 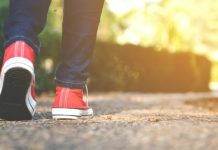 Just keep in mind that this list has no winner or loser as all these brands are great and worth a try. 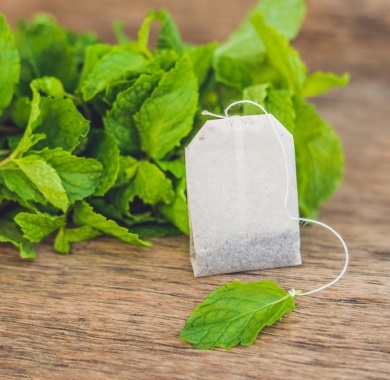 All you have to do is to learn about individual benefits, disadvantages, and taste of each peppermint tea and find the one that will suit your taste buds the most. 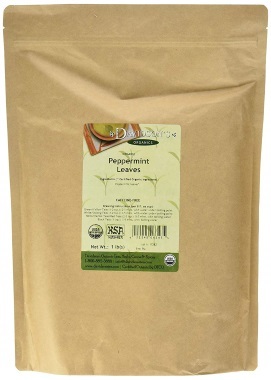 The Peppermint Leaves by Davidson´s Organics is a mint tea that has been USDA Organic certified. It comes without any tea bags and you will need a tea infuser to make your drink. This tea has a wonderful aroma that is strong and flavorful making it a perfect choice for a soothing and refreshing after-dinner tea. The Davidson´s Organics mint tea is packed in a resealable paper/kraft stand up pouch (SUP) with aluminum foil lining to maintain freshness. This way, your tea will always have the best aroma. 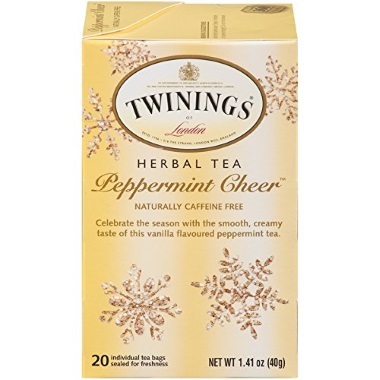 Twinings of London Peppermint Cheer offers a unique herbal tea. This special edition tea is a combination of peppermint leaves, natural mint aroma, and vanilla flavor. Twinings is a well-known brand that focuses on providing the highest-quality teas. Although I personally do not like the creamy flavor of vanilla, its combination with mint is really interesting. The best part? This beverage is excellent in both hot, as well as cold version. 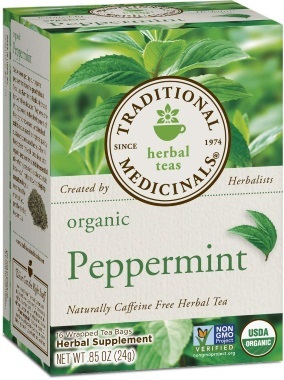 Organic Peppermint by Traditional Medicinals is an excellent choice if you are looking for a cup of high-quality mint tea. 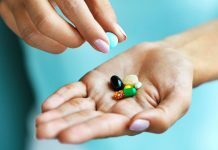 This brand claims they use the highest-quality, pharmacopoeial grade herbs. Not only that, they boast that this product is non-GMO verified, kosher, and all ingredients are certified organic. 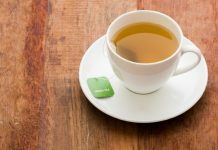 These individually sealed tea bags provide a calm, undeniably pepperminty, aromatic, and refreshing taste. 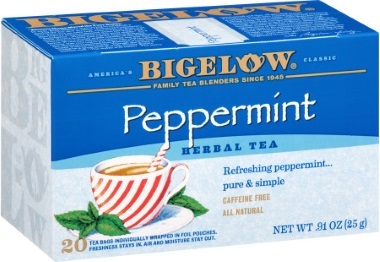 Peppermint herbal tea by Bigelow provides only the most refreshing, invigorating peppermint leaves and nothing else. These individually overwrapped tea bags ensure that the last cup of tea you have from this box is just as delicious as the first. Each tea bag is individually sealed in a foil packet and has been blended and packaged in the USA. I like the fact that it is not as pure and candy-like as others. 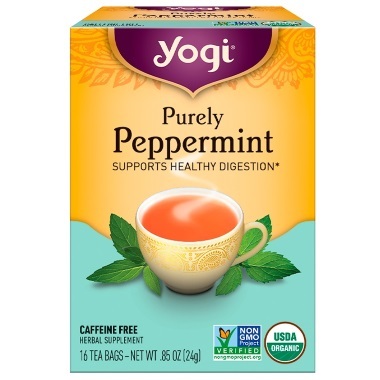 Purely peppermint by Yogi provides organic peppermint leaves that are packed in tea bags. 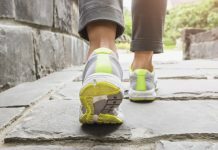 This brand is USDA certified organic and the whole project is non-GMO verified. This tea has a nice lighter color and refreshing aftertaste. Also, it is very calming and can be used for cold drinks as well. 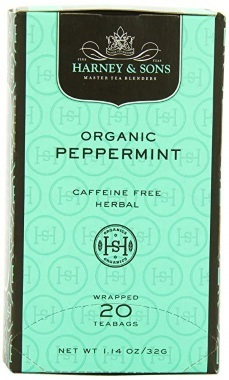 Organic Peppermint by Harney & Sons provides an excellent herbal solution for those who are looking for a calming and refreshing mint tea. What is great is the fact that this tea is made out of Oregon grown peppermint. 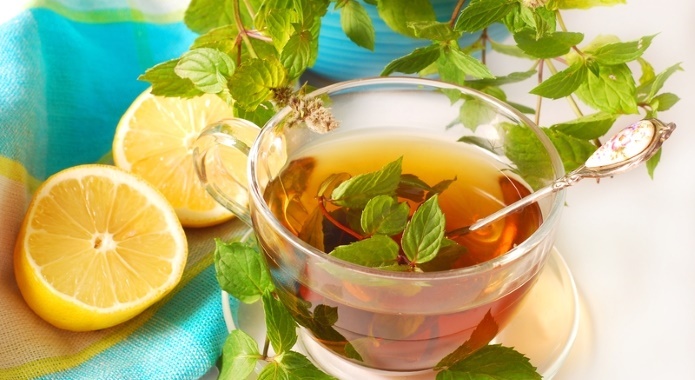 Also, this tea provides an incredibly fresh and invigorating peppermint flavor. The color is a light green with brown undertones. This seems to be one of the few high-quality mint teas that are grown within the USA. 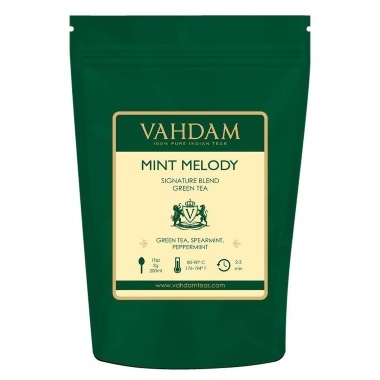 Vahdam is a global Indian company that specializes in various combinations of green tea. The Mint Melody is an incredible signature blend of refreshing peppermint, spearmint, and green tea. This aromatic combination is definitely a bold cup that is deeply reassuring and refreshing to the core. Not only that, the company claims that by purchasing their teas, which are delivered to your doorstep direct from source without any middlemen, you help a farmer get a better price for their produce. 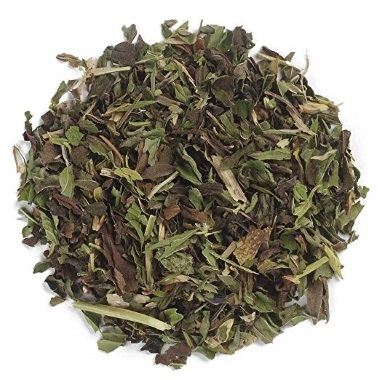 Peppermint tea by Frontier Co-Op is an excellent choice for those who are looking for loose leaf mint tea. This is a high-quality product that is organic and very aromatic. It has a potent “minty” taste that lacks strong grassy notes. Also, this brand provides even an organic version of mint tea. However, I was not able to find a country of the origin of used herbs. 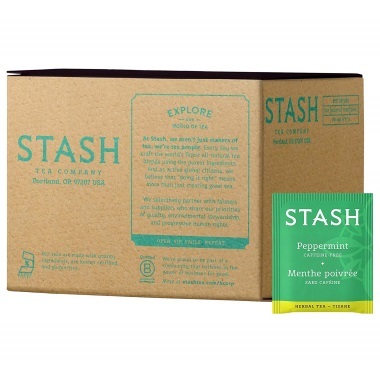 Stash provides a peppermint herbal tea that is really good. Its airtight packaging provides a feeling of freshness that lasts. However, the aroma is not that strong. It comes in individual tea bags that are handy and easy to use. Sadly, some people point out that these bags may contain stems that reduce the flavor of tea as they include fewer oils than leaves. 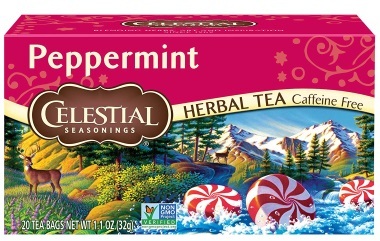 The Peppermint Herbal Tea by Celestial Seasonings is blended with peppermint from the Pacific Northwest for a cool, refreshing flavor. It comes packed in individual tea-bags. They are practical and provide full aroma and flavor. The tea in cup starts a green-brown color and quickly changes to a remarkably dense brown. The best part? This tea contains no artificial flavors, colors, or preservatives.